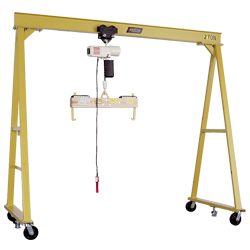 The BHS 3 Ton Non-Power Gantry Crane offers safe and easy vertical extraction for most standard forklift batteries. This cost-efficient gantry saves time and money by speeding up changeouts and keeping your fleet moving. The modular design of BHS gantries allows for easy system expansion. Models are available in 2-foot increments from 10- to 18-feet. The 3 Ton Non-Power Gantry Crane comes standard with 8-inch swivel casters, and floor mounts or rigid phenolic casters are available as optional features. BHS designs all products with worker safety as a high priority. Cable Festoon Kits protect staff by securing cables during operation of manual trolley. We use steel components for a more rugged and durable product that can safely lift a 3-ton battery. For quality assurance, our staff inspects each gantry before shipping. Simplify battery changing with a BHS gantry. Contact our sales team at 1.800.BHS.9500 to find out more about the 3 Ton Non-Power Gantry Crane or to find a local dealer.